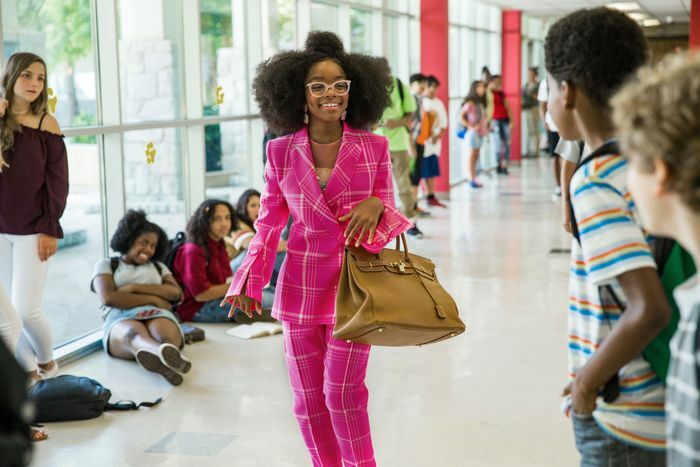 “This is an aspirational movie,” costume designer Danielle Hollowell explained of Little, the Tina Gordon–directed movie that applies the reverse Big formula to a ruthless tech mogul — played by both Regina Hall and Marsai Martin. Hollowell’s description is fitting. 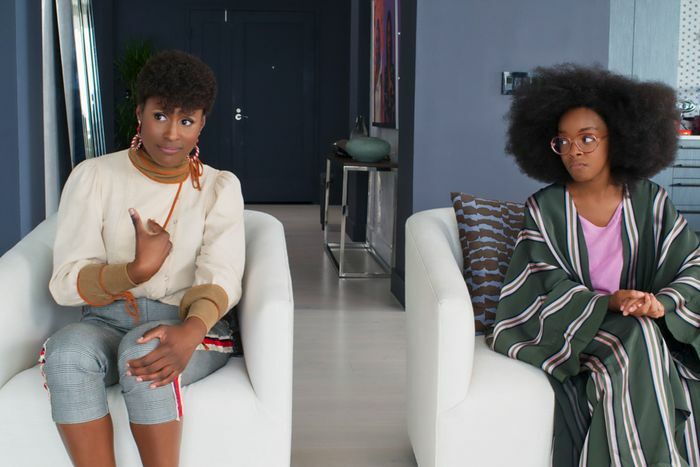 Aspiration is what fuels career-obsessed Jordan Sanders, before and after she wakes up to find that she’s swapped bodies with her teen self and has to retain the services of her long-abused assistant (Issa Rae as April) in order to continue running her company from behind the scenes. Aspiration is also what it takes to bring a body-switch story to the screen. 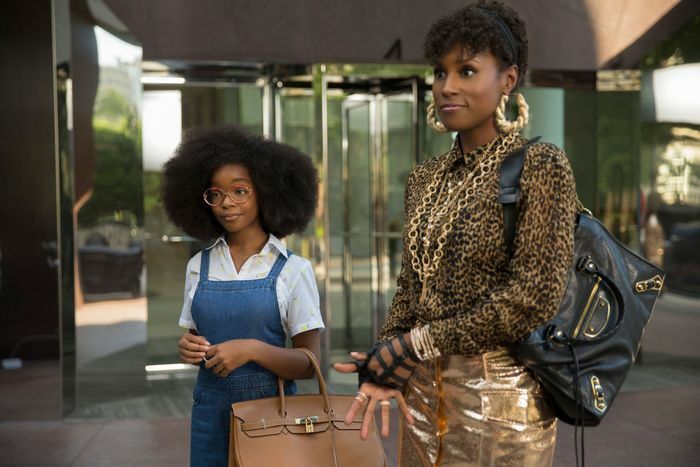 Like the rest of the Freaky Friday genre of movies, Little requires the audience to suspend belief as they watch a junior-high-age Martin, dressed in oversize designer clothing, bend her elbow just so and balance the kind of handbag that belongs on the arm of a seasoned tech CEO. 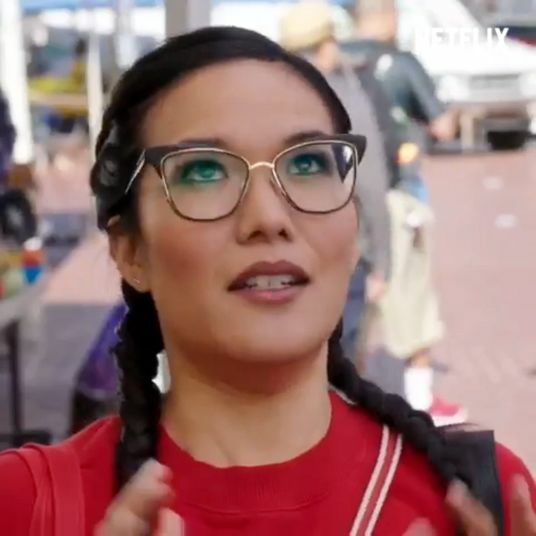 “That character is not going to go to mainstream stores,” says Hollowell of April, the assistant to a tech mogul whose life is considerably less glamorous than that of the woman who wakes her up at all hours to bark orders. To dress April, Hollowell looked to a combination of vintage shops and accessible designers like Alexander Wang, sprinkling in pieces that she made from scratch — like graphic T-shirts and a bomber jacket inspired by a vintage item she found. 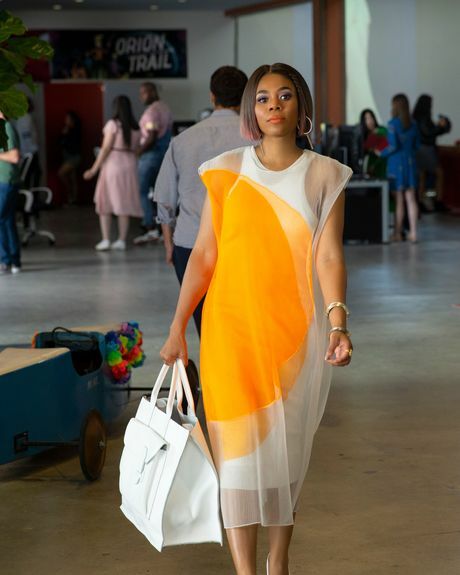 April might start out as a tastefully bohemian ladder climber — less a Maxxinista, and more a gifted thrifter — but as soon as she realizes that her boss Jordan has been literally downsized, desperately needs April’s help, and is willing to relinquish some of her designer duds as a result, the assistant’s taste in fashion shifts. 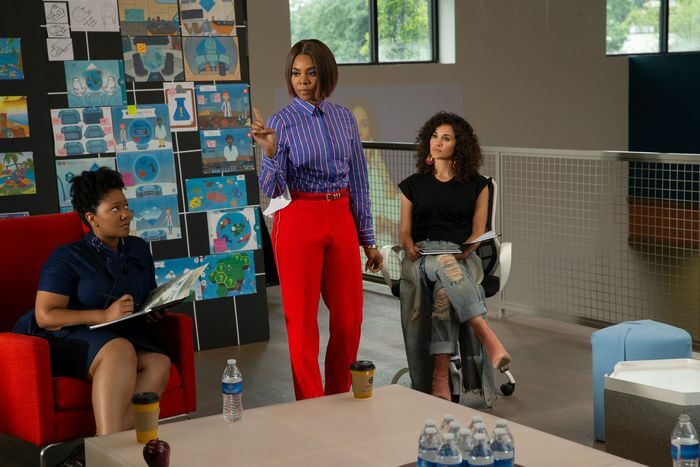 After she cuts a deal with Little Jordan and agrees to be the public face of her business, April borrows a comedic amount of designer apparel from Jordan’s wardrobe to look the part. And thus the loudest ensemble of the film (pictured above) was born. “We thought, Well, what is the part?” Hollowell says. “We started with the Chanel gloves straight up — that drove home the point of over-accessorizing. April didn’t really know [what to put on], so I decided to pour it on when I did that outfit. I took it to another level where almost every designer label that you can think of was in one outfit.” The outfit consists of a YSL leopard-print shirt, a House of London gold pencil skirt, and Charlotte Olympia butterfly shoes. “Then, of course, I piled tons of jewelry on her.” The look screams cutting-edge tech tycoon and unfortunate fashion victim all at once. Adult Jordan Sanders only has a few scenes in the movie, appearing at first as a structured, intimidating tech figure who bullies even the children around her. Near the end of the film (and if this is a spoiler, you’ve probably never seen a body-switch movie before), she returns as an approachable, reformed woman who’s survived a living nightmare and lived to tell the tale. For Hollowell, the challenge was finding pieces to reflect that transformation. But in present day, Martin plays an adult trapped inside a child’s body. To mark the difference in circumstances, Hollowell accessorized Jordan with an over-the-top sandy-colored Birkin bag (which was referenced in the script) and looked to a range of established designers, from Olivia von Halle (for a pair of shark-patterned pajamas) to Alice + Olivia. Fully aware of what a power suit would look like on a child, Hollowell dressed Martin in this pink Fendi number for the moment body-swapped Jordan walks down the hallway of her new school with the authority of ten adults. 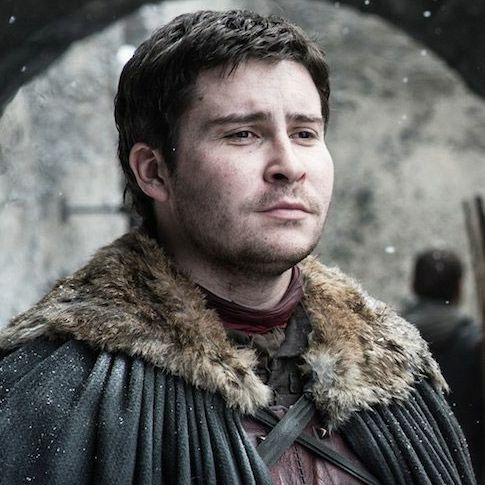 “I don’t like trying to make children into adults,” Hollowell says. “But I saw [the suit] a long time ago. It had everything. It could still be worn by a child [and] it was also something that the adult would have worn. 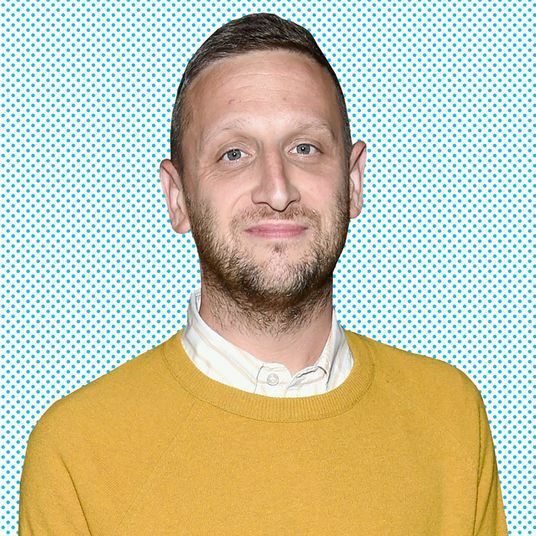 That said everything about that character.” Hollowell paired it with pink and orange suede Jacquemus shoes — “They were block heels; one was square and one was circle” — and added a glittery Christian Dior top to go underneath.